...is the engaging saga of Henry Herman Sr., a young and intrepid Austrian-American in 1899, who sought adventure in Southeast Asia when the region was the only part of the world left to be colonized by the United States—an emerging World Power at the turn of the 20th Century. He enlisted in the United States Army, but was unable to fight in the short-lived Spanish-American War in 1898. However, he found himself across the Pacific Ocean fighting in another bloodier American war in some distant place called the Philippine Islands. The story is doubly significant as the personal account of one of those brave pioneers, and as a history of the early American presence in the Philippines. 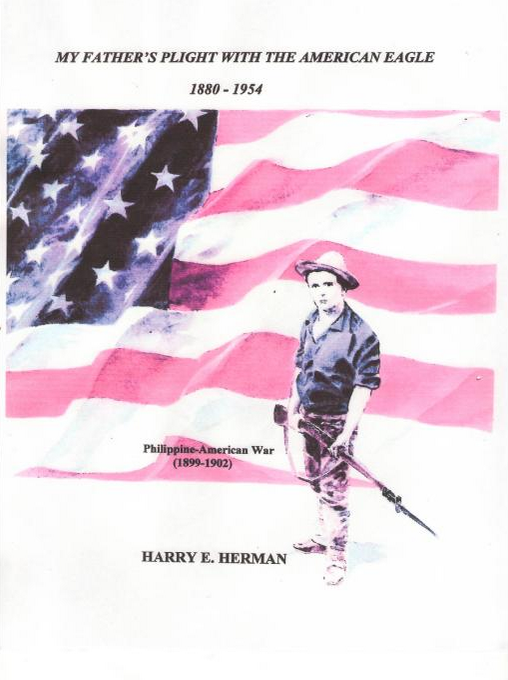 Henry Herman Sr., a veteran of the Philippine-American War, was hardly 21 years old in 1901 when he was honorably discharged in Manila. The army private, almost penniless as a civilian but gifted with the right stuff, became overnight an empire builder in the Philippines in the electrical, telephone, and radio business. He built and owned in Manila the first commercial radio broadcasting station in Asia in 1922. His personal friends in the Philippines were William H. Taft, American Civil Governor-General (who later became President of the United States); Manuel L. Quezon, Philippine Senate President (later President of the Philippine Commonwealth); and, General Douglas MacArthur, United States Army; etc. General MacArthur and Henry Sr., both born in 1880, developed a close friendship as young bachelors in their mid-twenties in Manila when MacArthur was a lieutenant fresh from West Point. Both Quezon and MacArthur socialized with him at the Casino Español (Spanish Club) and at Henry Sr.'s mansion in Manila. Henry Sr. had twenty children: ten from his first wife, Dolores; and, when Dolores died, ten from his second wife, Donata. Two of his sons from the first marriage, Captain Joseph Herman, U.S. Army, and Charlie Herman, made the supreme sacrifice, giving up their young lives for the glory of the Stars and Stripes during World War II in Manila. There was a reversal of fortune for Henry Herman Sr. in 1935 when the Philippines became a Commonwealth (later gaining her independence from the United States in 1946). During the Pacific War in Manila (1942-45), Henry Sr. was forced to sell electrical supplies to the Japanese military under extreme duress. Consequently, he was charged with collaboration with the Japanese enemy right after the war, and was denied his pension rights as a veteran at the time he needed it the most for his wife and their family of eight children of tender ages. Ironically, he was denied his Constitutional rights to trial by jury, to face his accusers, and to question them—the very same Constitution he swore to uphold and defend and, if need be, give up his life as an American soldier in the Philippine-American War. What a travesty of American justice in the 20th Century! Henry Herman Sr. fought for justice to the very end, to no avail. His eldest son from the second marriage, the author, Major Harry E. Herman, U.S. Army, Retired, now continues his father's fight. No monetary compensation is sought, but only American justice, to remove the stigma of collaborator. Harry E. Herman is a retired major in the United States Army with twenty-four years service: six years active (1957-63) and eighteen years active reserve (1976-94). He enlisted at seventeen right after high school in 1957, helping his widowed mother raise seven younger brothers and sisters. He was assigned in Europe and the Far East. He rose from the enlisted ranks, serving during the Vietnam War. His last military assignment was as Civil Affairs Officer with the U.S. Army 51st Civil Affairs Brigade (Airborne) when he retired in 1994. Mr. Herman is the author of two mystery novels: "Inspector 993, Hollywood International Airport" (1998), and "The Iraqi Connection, SC-3 in San Francisco" (2006). His latest two non-fiction books are: "A Christian Theology on the Redemption of our Animal-Friends by Our Lord Jesus Christ -- Dogs and Cats Also Go to Heaven" (2008), and "My Father's Plight with the American Eagle 1880-1954 -- The Philippine-American War (1899-1902)". .
Mr. Herman is also a retired Senior U. S. Customs Inspector with thirty years full-time service (1970-2000). He worked at various airports and/or waterfronts in New York City (1970-71); Los Angeles --including the Tijuana Mexican border (1972-74); and, San Francisco/Oakland, California (1974-2000). He taught at the U.S. Customs Service Academy, Georgetown University, Washington, D.C.; Instructor to the Qatari Customs in the Middle East; and, Training Officer in San Francisco responsible for training U.S. Army/Navy/Air Force/Coast Guard Military Police as part-time Customs Officers at their respective bases. Mr. Herman holds four collegiate degrees: A.B., Political Science, minor in U.S. History (1966) and M.A., Public Administration (1968) from the University of the Philippines (recognized by Harvard and Yale). He completed the four-year U.S. Army Command and General Staff Course, which is equivalent to an M.S. degree in United States/Russian Military Science and Tactics (1987). His latest M.A. degree is in Theological Studies from the Jesuit School of Theology in Berkeley, California (2007). He holds a California Community College Teaching Credential in Public Services and Administration, and Political Theory (1976) valid for life. Harry E. Herman loves to read and write in his retirement. He makes good use of his customs and army experiences in his writings, influenced also by his varied education. He is a pastoral minister at Saint Clement Catholic Church in Hayward, California. You can buy Harry E. Herman's latest book, "My Father's Plight with the American Eagle," on Amazon.com today. We use a tool called Google Analytics to collect information about use of this site. Google Analytics collects information such as how often users visit this site, and from which other site they arrived here. We use the information we get from Google Analytics only to improve this site.